November 20th, 2015. In today's Digimon Adventure tri. livestream, hosts Mimori Suzuko (Sora), Enoki Junya (Takeru), and Ikeda Junya (Jo) revealed the latest information on the upcoming open world game Digimon World -next 0rder-. 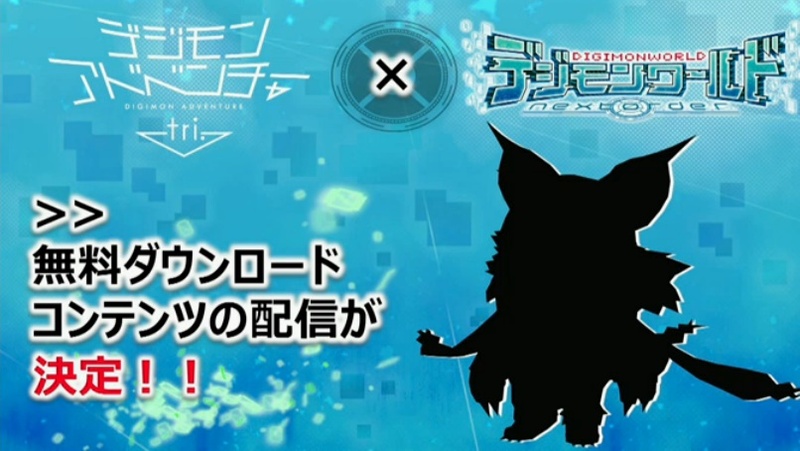 In a crossover campaign between the two branches of the franchise, tamers will be able to freely download the Adventure tri. movie-original Digimon Meikuumon (shown in silhouette) to their copies of -next 0rder- for use in the game as one of their two Digimon partners. Any possible evolutions or "EXE"-Volutions for Meikuumon are currently unknown. This appears to be the "linked content" alluded to in previous issues of V Jump magazine. A recording of the livestream is currently being edited and processed for YouTube. Update: After several delays, the recording of the stream has been uploaded.